act. It is my belief that most people have good intentions and kind hearts. However, misunderstandings, anger, and hurt feelings may be some reasons that interfere with one's ability to act in a kind manner. Learning calming down techniques, empathy, and seeing another person's point of view are some ways that encourage and lead to kind acts. In addition to one's temperament, another factor contributing to kindness, may be one's natural personality type. For example, some people are introverts and shy by nature. They may appear quiet and standoffish, when in reality, they just need a little more time to feel comfortable. They may be kind people, who are misunderstood. Tell someone why they are special. Donate a book to a doctor's office. Invite someone new to play at recess. 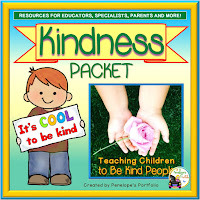 Those and many other ideas are available in my Kindness Packet. The packet may be used by teachers, parents, school counselors, social workers, speech therapists, special education teachers, and other specialists. Included in this packet are activities, printables, posters and awards. To see full details, click here. What is your favorite act of kindness? I don't know if I have just one favorite act of kindness. The one I do most often is donating to thrift stores, but that is almost selfish because it is also helping me by getting rid of things. I have worked at food banks in the past, but we don't have anything like that where I live now. I do a lot of little acts of kindness, but I need to figure out a way to give back on a bigger scale. Maybe I'll make that my mission this holiday season! Like you, I also enjoy donating items, and teaching my children to donate their items to those in need. I agree, it is a great feeling to rid oneself of unwanted items. I guess that is just a win-win! 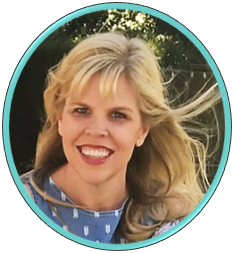 Thank you for hosting your Tuesday link up. I enjoy your blog and look forward to sharing it's posts across my networks as well. Take care! Thank you for your kind words! Kindness does see to show it's face everywhere. Your students are lucky to have a teacher like you who incorporates it in everything. Take care! 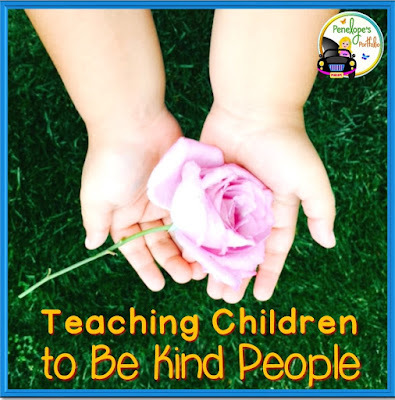 With so much bullying going on in schools these days it's important that we teach kids to be kind. I like having kids do kind things for veterans. It teaches them to give back, to honor and respect our armed forces, and it also helps kids to reflect on what it means to be a good citizen.